There are about 52 Sundays in a year and most churches have Wednesday services and conferences here and there. If we tally all of these we have a minimum of approximately 104 times at which an average believer finds themselves sitting down to listen to someone preach every single year. 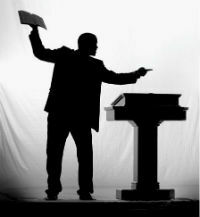 104 Sermons! I asked myself this; when people look at my life, do they see the 104 sermons I receive yearly? Isn’t the Word of God supposed to shape me into Christ? When I move onto the following year, do I move with the faith which is supposed to come from hearing the Word, or do I continue with the same old self that has slightly improved here and there, going in the same circle in life? Join me in the following weeks as we explore how we can get the most out of the Word we receive from sermons and our personal bible study time with the Lord and also have a passionate desire for the true Word instead of fables that suit our preferences. Follow my blog on www.tshidiamu.wordpress.com to get update on every single post.